Walk into Carol Swift’s design studio, and you know you’re in the milieu—or maybe even in the mind—of a real artist. It has the wonderful clutter and crazy allure of a creative person who lives among the objects and emblems of her craft. In this case: fabrics, swatches, rugs, antiques, prints, paintings, cubbyholes, books, baskets, curios, old computers, paperwork, and an old phone. Carol did in fact go to art school. 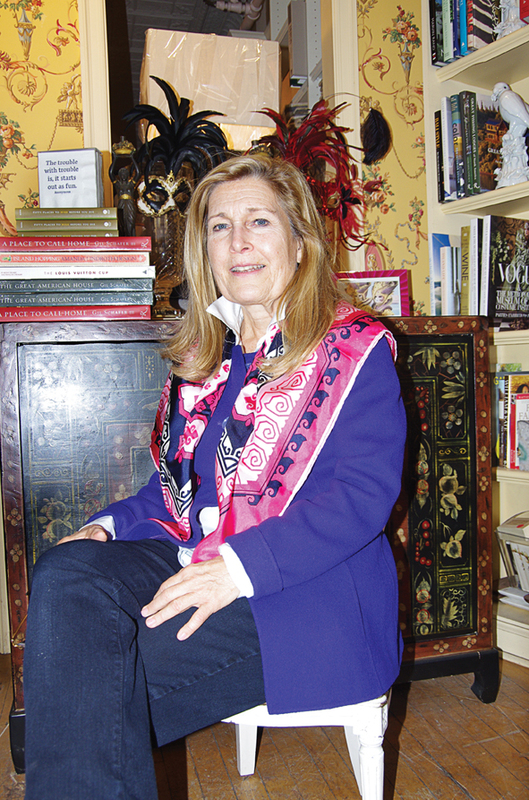 She’s been living in Hoboken since 1980 and started her interior design business in 1983 in the building she still occupies. Designing an interior is more than picking the right fabric. Carol says she has to know the lifestyle of the client, how he or she lives or wants to live. “I love collaborating and doing things I’ve never done before,” she says. It starts with knowing the function of the space. She’s designed a sewing room that is much more conducive to the art of sewing than just setting up a sewing machine in the back of some storage room. “From the function come the furnishings, the look, the color, the pretty things,” she says. She’ll probably never say goodbye to the business, but if she did switch careers, she’s identified the perfect dream job: naming paint colors.